It is impossible to see all of Washington DC in one day, but a day trip can be fun and rewarding. Here are our suggestions for how to get the most out of a first-time visit. This itinerary is designed to be a general interest tour. For a comprehensive exploration of the city, check out some of the city’s historic neighborhoods and its many world-class museums and other landmarks. Note: Some attractions require advanced planning and tickets. ​Be sure to plan ahead, determine what you really want to see and set those sights as priorities. For this tour, you will need to book your tour of the Capitol Building and your tour of the Memorials in advance. The most popular attractions in Washington DC are least crowded early in the morning. To get the most out of your day, get an early start and you will not have to waste time waiting in lines. Be aware that traffic in Washington DC is very congested and getting in to the city on a weekday or a busy weekend morning is challenging for residents and more difficult for tourists who do not know their way around. Take public transportation and you will avoid the hassle of finding a place to park. Arrive early at the Capitol Visitor Center (Hours are Monday-Saturday, 8:30 a.m. - 4:30 p.m.) and learn about the history of the U.S. government. The main entrance is located at the East Plaza between Constitution and Independence Avenues. Take a tour of the U.S. Capitol Building and see the Hall of Columns, the rotunda, and the old Supreme Court chambers. From the visitors’ gallery, you can watch bills being debated, votes being counted, and speeches being given. Tours of the Capitol are free; however, tour passes are required. Book your tour in advance. The Visitor Center has an exhibition gallery, two orientation theaters, a 550-seat cafeteria, two gift shops, and restrooms. Tours of the Capitol begin with a 13-minute orientation film and last approximately one hour. 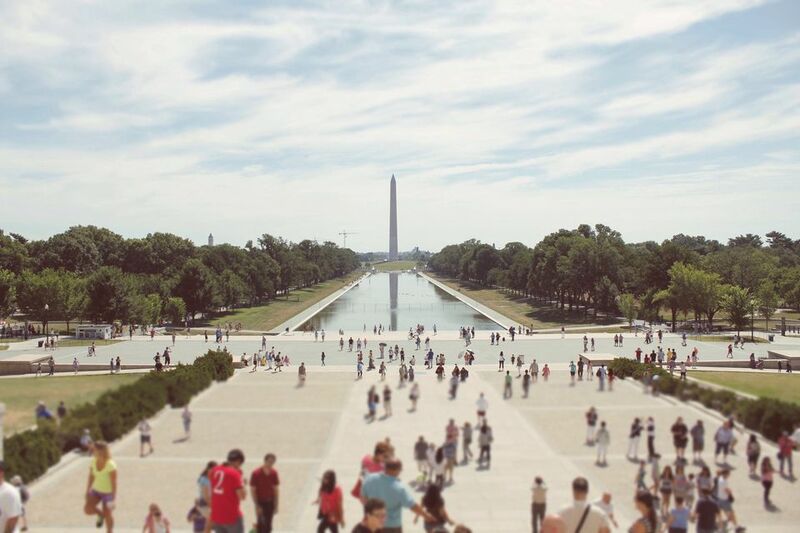 After your tour of the Capitol, head to the National Mall. The distance from one end of the Mall to the other is about 2 miles. It is walkable, however, you probably want to reserve your energy for the day, so riding the Metro is a good way to get around. From the Capitol, find the Capitol South Metro station and travel to the Smithsonian station. The Metro stop is located in the center of the Mall, so when you arrive take some time to enjoy the view. You will see the Capitol to the East and the Washington Monument to the West. The Smithsonian is comprised of 19 museums. Since you have limited time to tour the city, I would suggest that you pick just one museum to explore, either the National Museum of Natural History or the National Museum of American History. Both museums are located across the Mall (to the north of the Smithsonian Metro Station) There is so much to see and so little time--grab a museum map and spend an hour or two exploring the exhibits. At the Natural History Museum, take a look at the Hope Diamond and other gems and minerals, examine the massive fossil collection, visit the 23,000-square-foot Ocean Hall, see a life-size replica of a North Atlantic whale and a 1,800-gallon-tank display of coral reef. At the American History Museum view the original Star-Spangled Banner, an 1815 tavern sign to Helen Keller's watch; and historic and cultural touchstones of American history with more than 100 objects, including the rarely displayed walking stick used by Benjamin Franklin, Abraham Lincoln’s gold pocket watch, Muhammad Ali’s boxing gloves and a fragment of Plymouth Rock. You could easily waste a lot of time and money on lunch. The museums have cafeterias, but they get busy and are pricey. You may want to bring a picnic lunch or buy a hot dog from a street vendor. However, your best bet is to get off the Mall. If you head north on 12th Street towards Pennsylvania Avenue, you will find a variety of places to dine. Aria Pizzeria & Bar (1300 Pennsylvania Ave NW), is a reasonably priced casual eatery in the Ronald Reagan International Trade Building. Central Michel Richard (1001 Pennsylvania Ave.
NW) is a little pricier but owned by one of Washington’s most renowned chefs. There are also affordable options nearby such as Subway and Quiznos. After lunch, walk west on Pennsylvania Avenue and you will come to President’s Park and the White House. Take some photos and enjoy a view of the White House grounds. The seven-acre public park across the street is a popular site for political protests and a good place to people watch. The monuments and memorials are some of Washington DC’s greatest historic landmarks and are truly spectacular to visit. If you want to go up to the top of the Washington Monument, you will have to plan ahead and reserve a ticket in advance. The memorials are very spread out (see a map) and the best way to see them all is on a guided tour. Afternoon tours of the memorials are available by Pedicab, Bike or Segway. You should book a tour in advance. If you take your own walking tour of the memorials, note that the Lincoln Memorial, the Vietnam War Memorial, Korean War Memorial and the World War II Memorial are located within a reasonable walk of each other. Likewise, the Jefferson Memorial, the FDR Memorial, and the Martin Luther King Memorial are located near one another on the Tidal Basin. If you have time and energy to spend the evening in Georgetown, take the DC Circulator Bus from Dupont Circle or Union Station or take a taxi. Georgetown is one of the oldest neighborhoods in Washington, DC, and is a vibrant community with upscale shops, bars, and restaurants along its cobblestone streets. M Street and Wisconsin Avenue are the two main arteries with plenty of good places to enjoy happy hour and dinner. You may also take a walk to Washington Harbour to enjoy the Potomac Waterfront views and popular outdoor dining spots. 10 Labor Day Weekend Events in Washington, D.C.